The only reason I ain’t calling these ‘Greek’ stuffed peppers is simply because nothing in this recipe unfortunately is from Greece….mores the pity. In fact….I’m so disappointed because of this that I just booked a week in Greece to compensate. Whilst nothing is ‘Greek’ everything is quality and sourced from a butchers and a green grocers of serious repute….and they may, probably have been in Greece at some point! Serve these with nothing more than a mountain of Tzatiki and crust Greek ‘style’ bread! Kick things off by splitting the peppers in two right through the stem, remove the seeds and as much of the pith as you can but leave the stem…..it looks a bit funky when it chars. Smother then peppers in good olive oil, season with salt flakes then sling in a pre-heated oven at 180c – we get back to these in about 20-25 minutes! Next bop a wide shallow pan on the heat, soften the onions, courgette and garlic for a couple of minutes then straight in with the minced lamb. When the lamb begins to get a nice brown on it add the chili flakes, cumin, tomato paste, oregano and anchovy paste and cook out for a further 5-8 minutes. Season as required then add the rice and combine well. If things look a little dry then add in a splash of water or even better….beer. You can leave the minced lamb mix simmer until the peppers are done – check them after 20 minutes and if they are soft and chared then they are ready to stuffed. 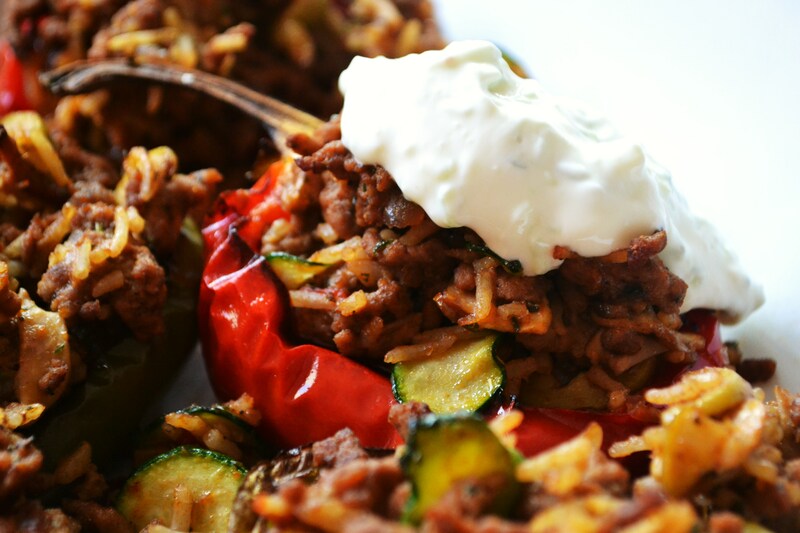 Spoon the minced lamb mix into the peppers and serve with a big dollop of Taztiki!